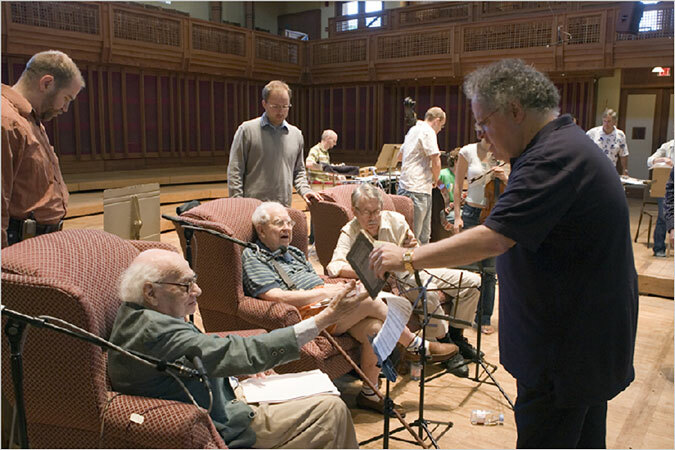 Seated from left, the composers Milton Babbitt, Elliott Carter, and John Harbison rehearse for “L'Histoire du soldat,” led by James Levine, right, in 2006. In the first twenty-four hours since his death, much has already been written about what Babbitt‘s contributions to music were and were not. And much more will be. My own small piece (though large enough for me) is not a technical or argumentative one. In the ’90s, I had dinner with him, Victor Yellin, and Martin Bernstein. What seemed to me an almost unbelievable privilege then seems no less so in retrospect. The easy conversation lent reality to historic events in music, as narrated by him, that was new to me — even though I had been educated largely by men and women of his generation. Witty, generous, and helpful: those are the adjectives that I carry around as captions under my mental image of him whom I had thitherto thought of as a terrifying lion of modern music.